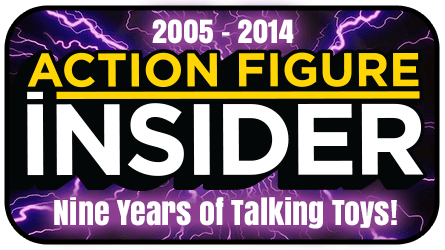 Action Figure Insider » AFi’s 9th Anniversary “Scoop Week” – Day 6 – Mattel’s SDCC 2014 DCUC Doomsday BOUND! The scoops keep on coming! Even the weekend can’t slow us down. We’re SCOOP-CRAZY!! 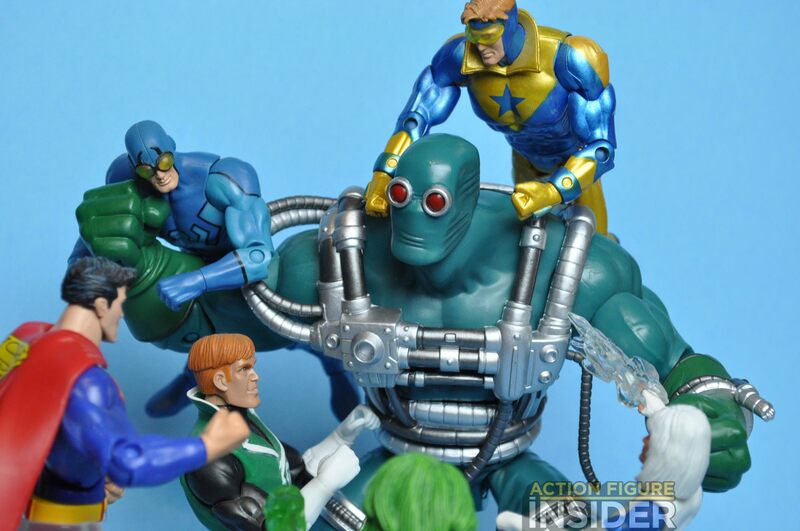 Here’s a scoop from our friends at MattyCollector.com. 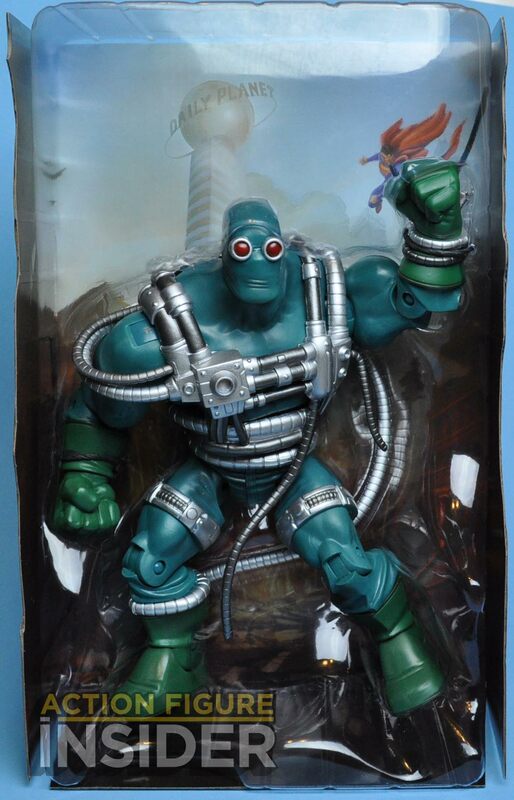 Today we are going to look at Mattel’s DC Universe Classics/DC Signature Collection DOOMSDAY, which will be one of Mattel’s 2014 SDCC exclusives. 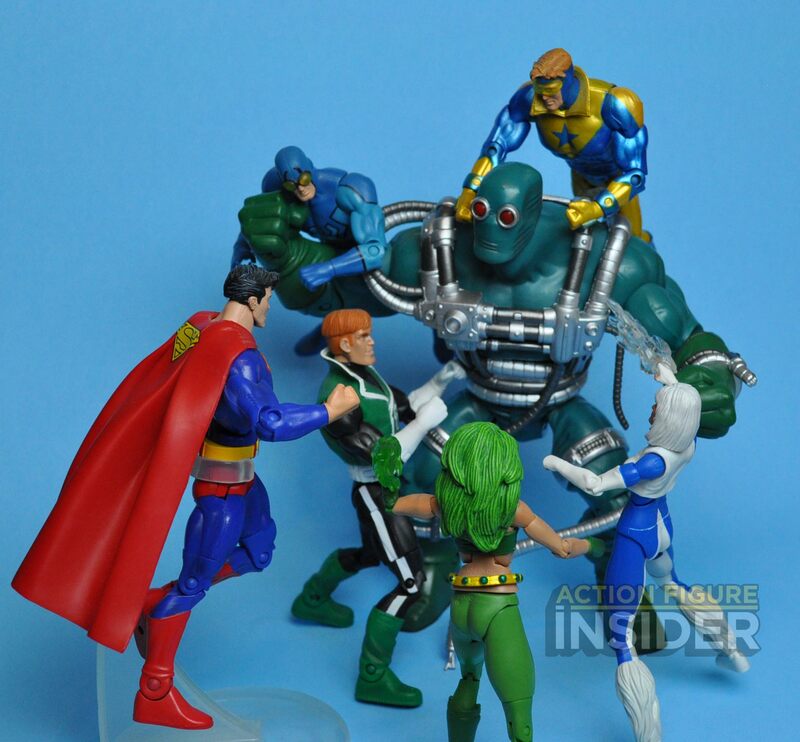 I’m not going to go into the whole history of this figure, the Unbound version and the unfunded 2014 Club Infinite Earths DC subscription. All that is in the past and it will not change. 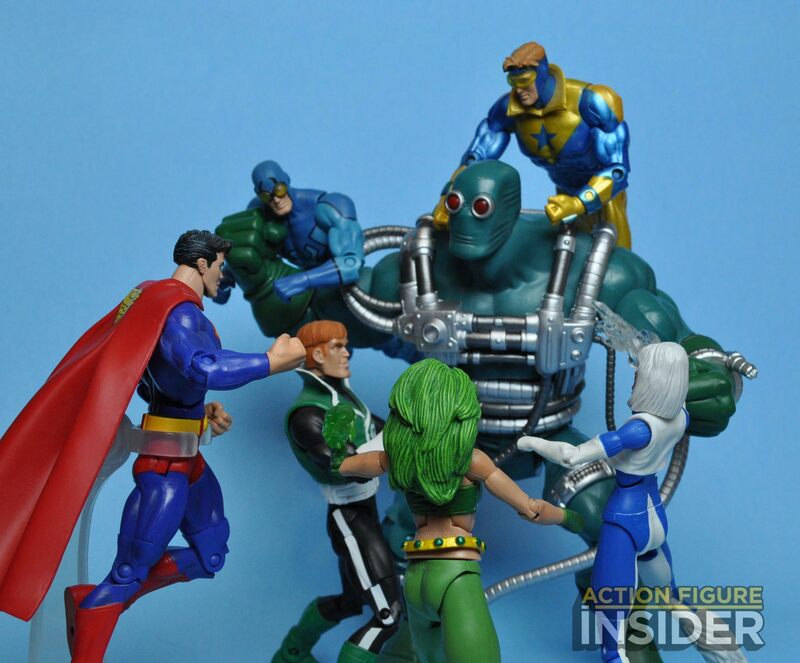 The sub did not fund, but Mattel found a way to get the first 5 figures into the hands of collectors. 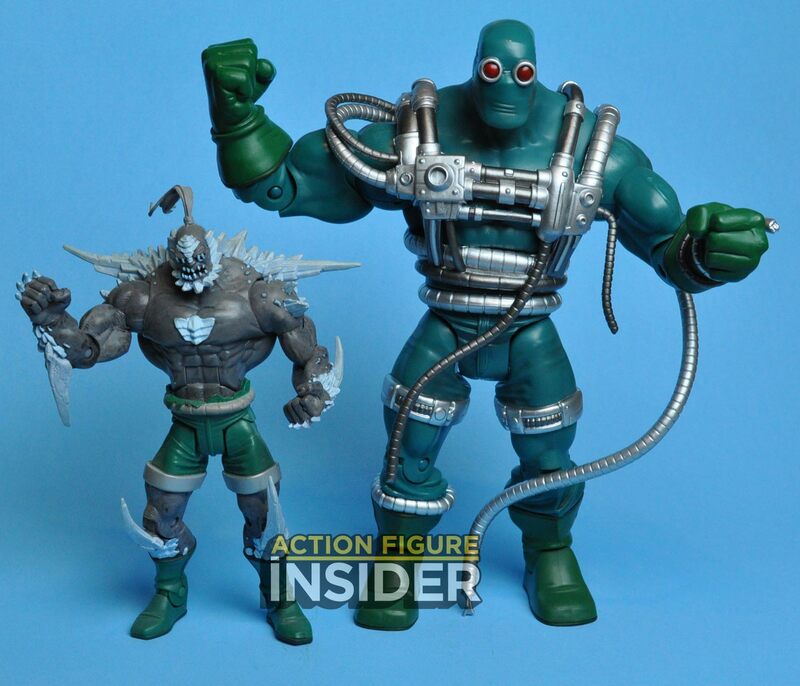 Doomsday will be a con exclusive. We’ve seen pictures of the figure before, but this is an exclusive first look at the packaging for this figure. 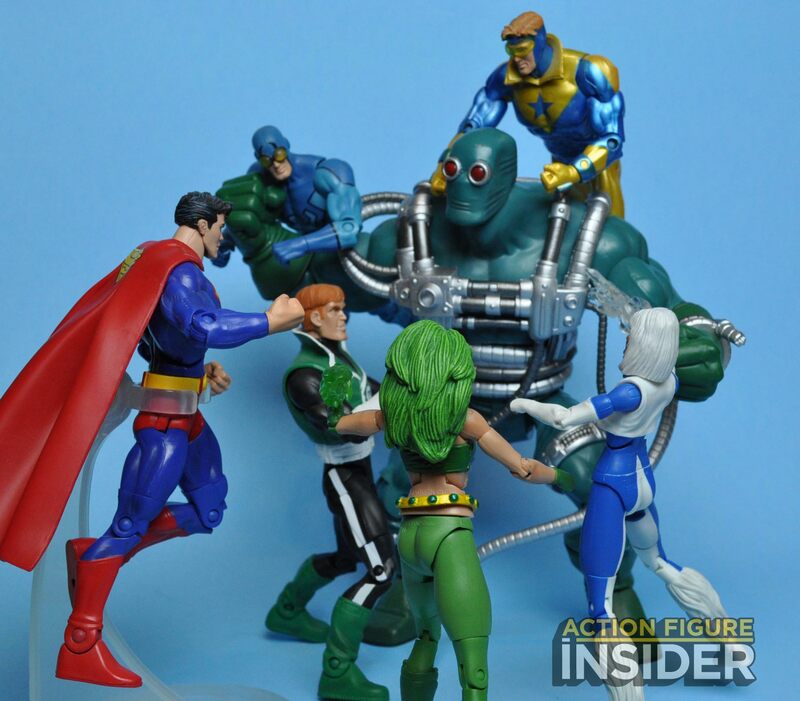 I’ve seen the pictures and the prototype for this figure at a couple of shows, most recently at Toy Fair, but it’s not until I had the figure in hand and put him next to other figures in the DC Universe Collection that I saw just how big this over-sized figure was. This is the size Doomsday needs to be. This is the size of a creature that could kill Superman. While it might not be the version every fan wanted, as someone that originally read the Death of Superman story line as it was being published it’s still fun to get this version. I remember picking up the issues week after week, seeing the containment suit get damaged, and ripped but still not quite knowing that the creature underneath was going to look like. 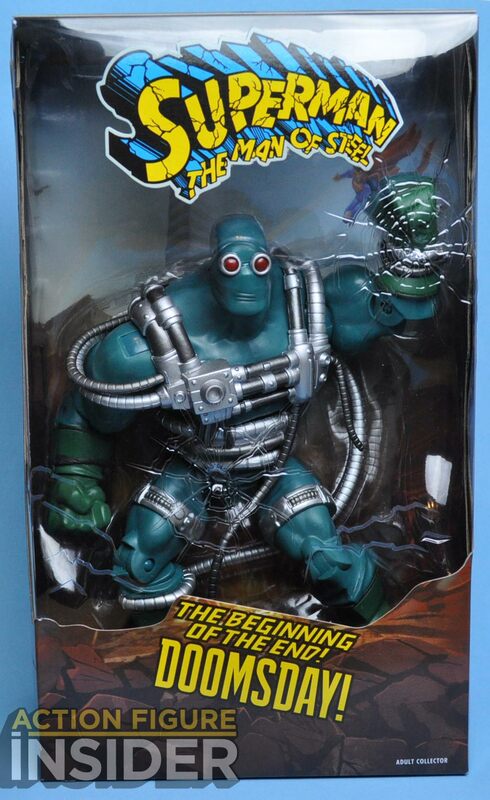 We have gotten a handful of Doomsday figures in the past. 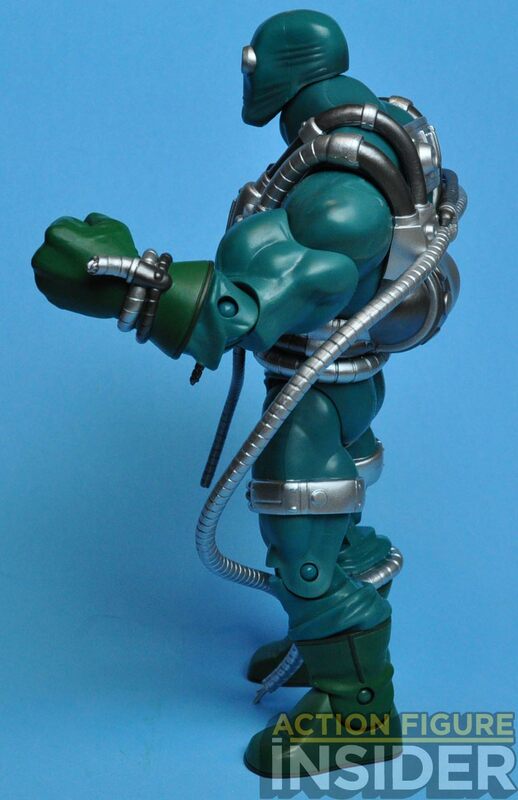 Kenner made a 5″ one in a 2-pack. 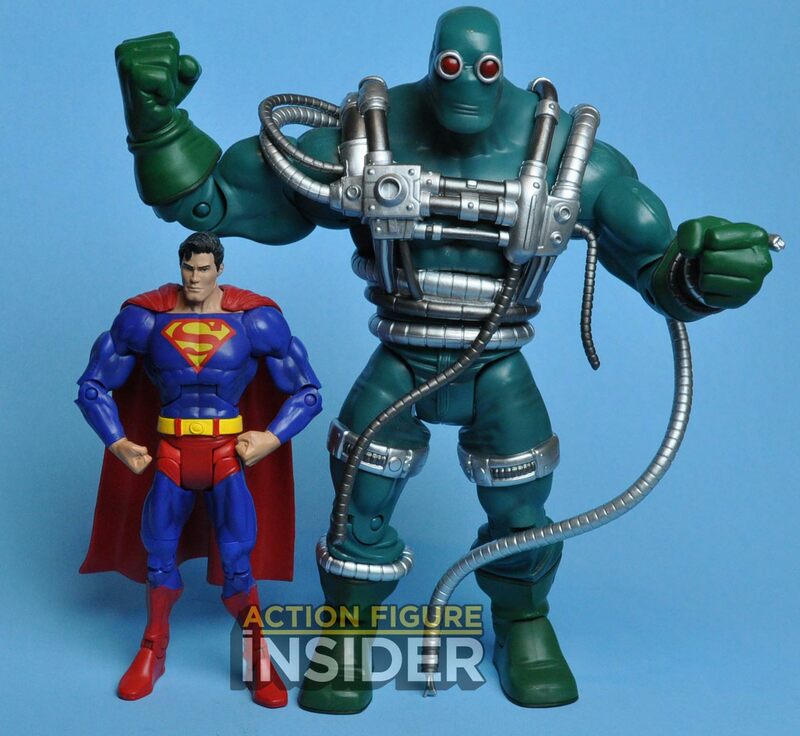 DC Direct made a 6.5″ one sculpted by Tim Bruckner, and Mattel has made one before in their 6″ DC Super Heroes line, but this is the first time containment suit Doomsday that has been made into a figure. 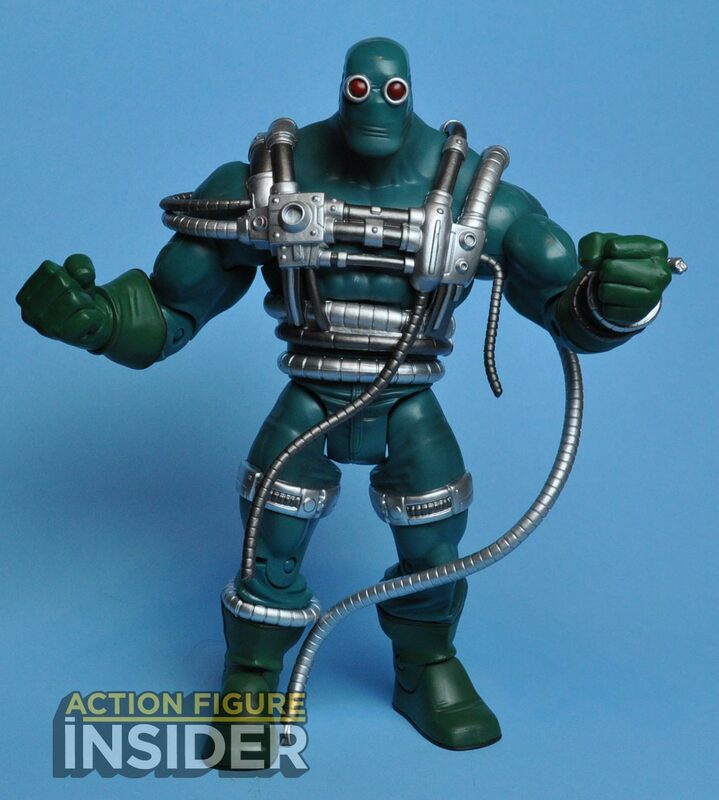 In looking at the preliminary designs for this figure we know that it’s based on the oversized Kilowog body. 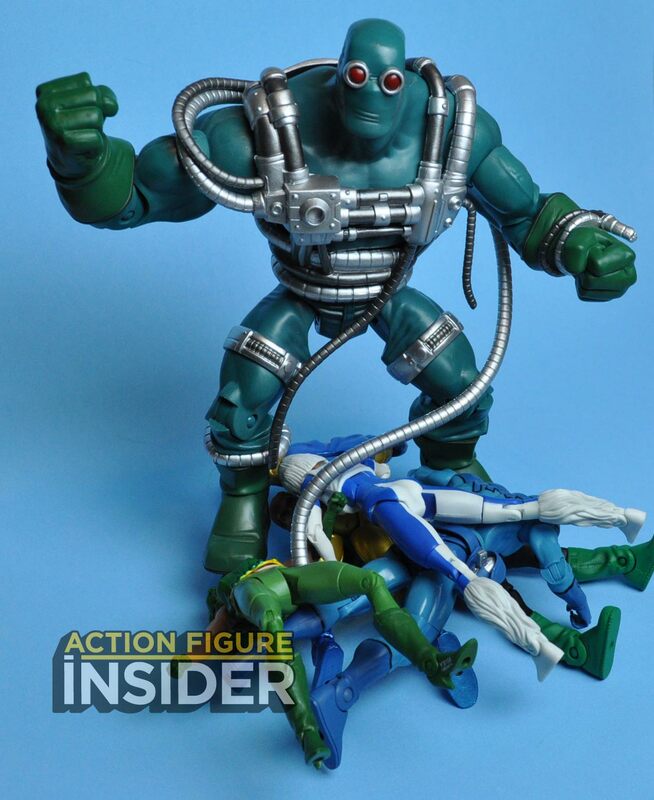 I thought that the figure would use more of that base body and use the “over-shirt” /harness technique that Mattel uses so much on the MOTUC figures. That is not the case and there’s a lot more new tooling on this figure than I anticipated. 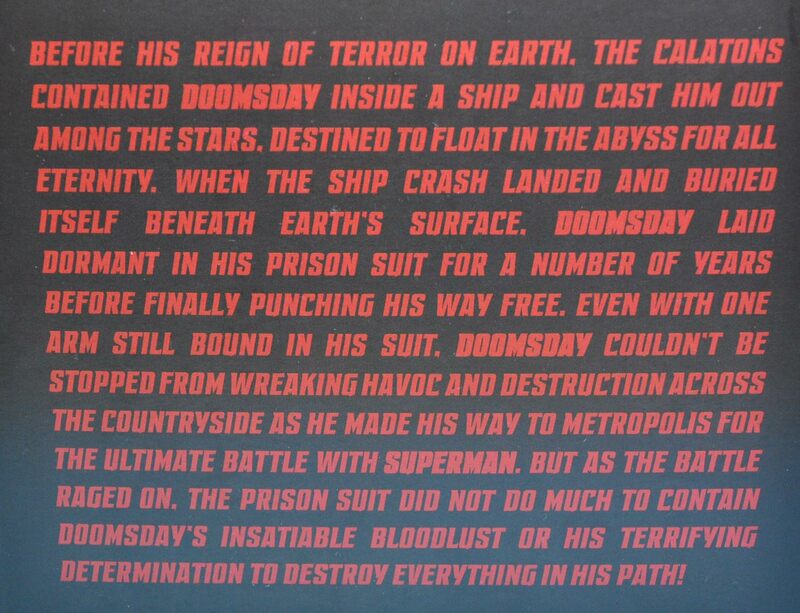 The outer mailer box is black with a great red “Death of Superman” logo on the front and Doomsday’s bio on the back (since his other bio on the back of the main box is bursting off the page). 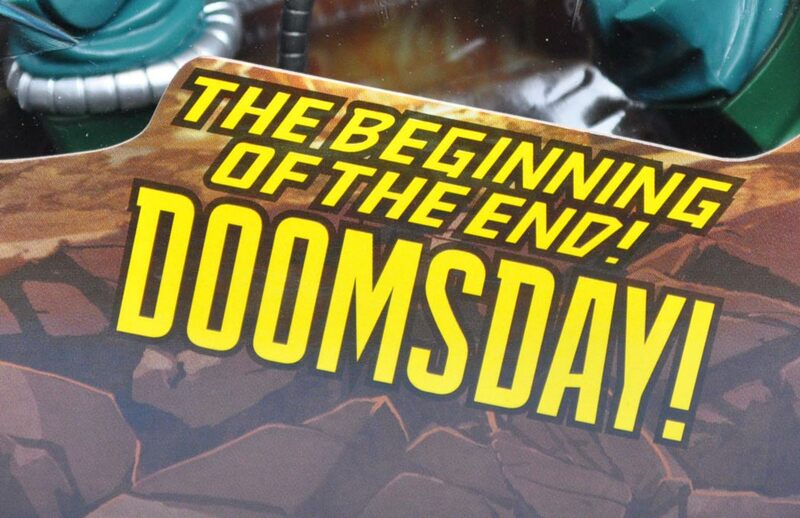 Mattel always goes all out on their con exclusive packaging and Doomsday is no exception. 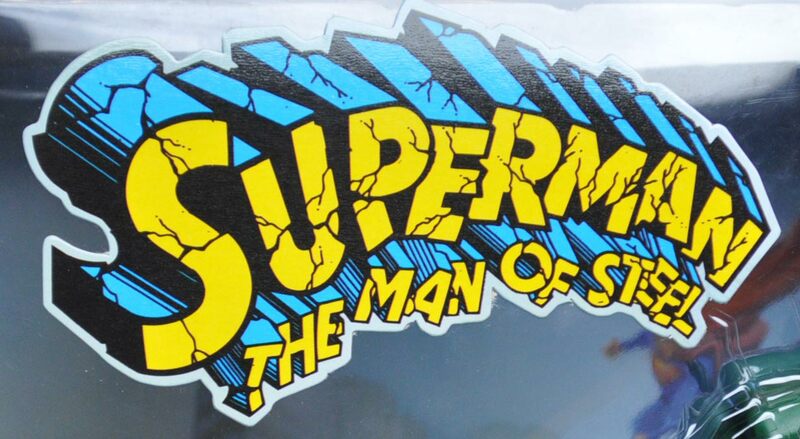 The package looks a lot like the cover of Man of Steel issue #18. 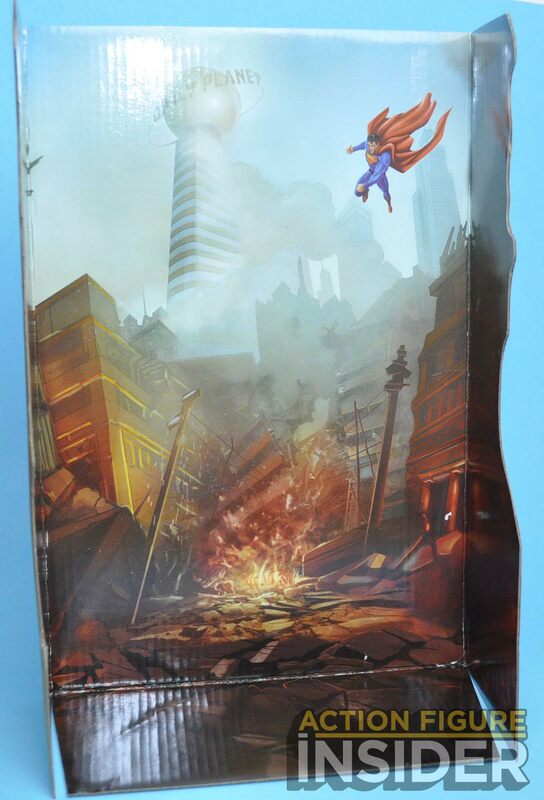 The wraparound image on the box show the destruction of Metropolis. Inside the destruction continues. 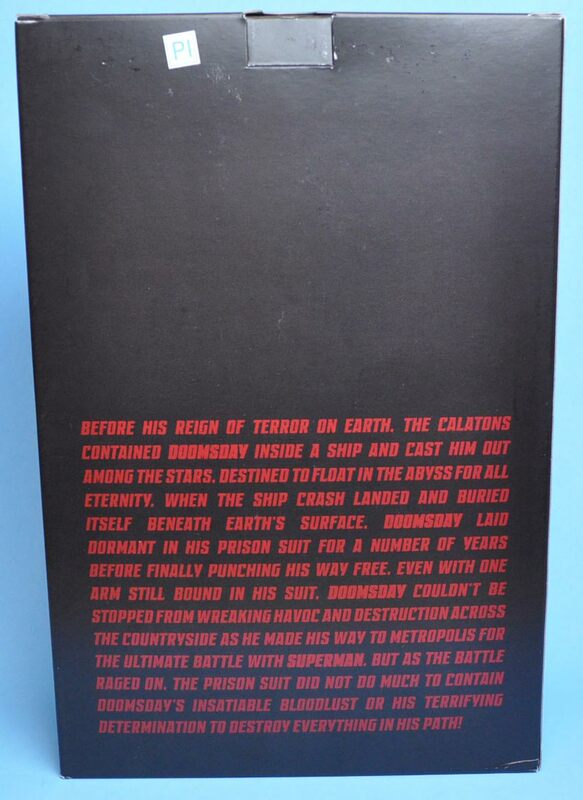 The bubble of the box is cracked from one of Doomsday’s punches. 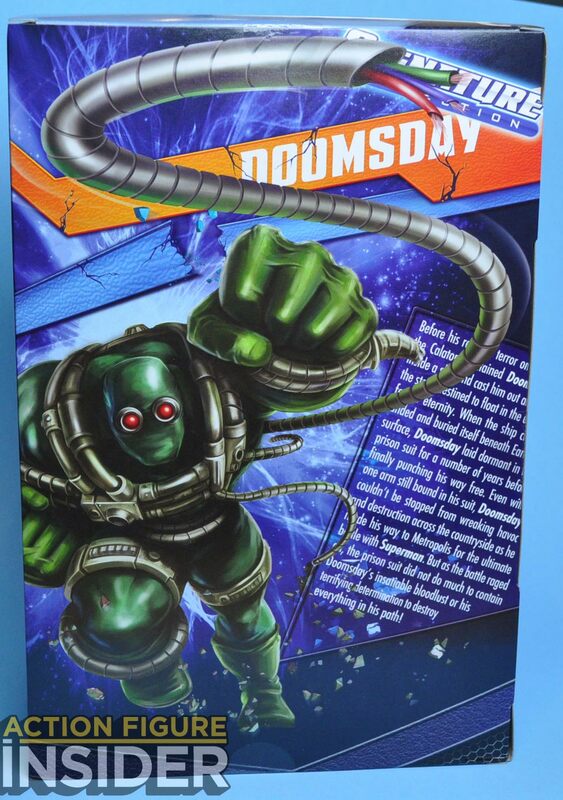 The back of the box has Doomsday busting out and coming right at you! 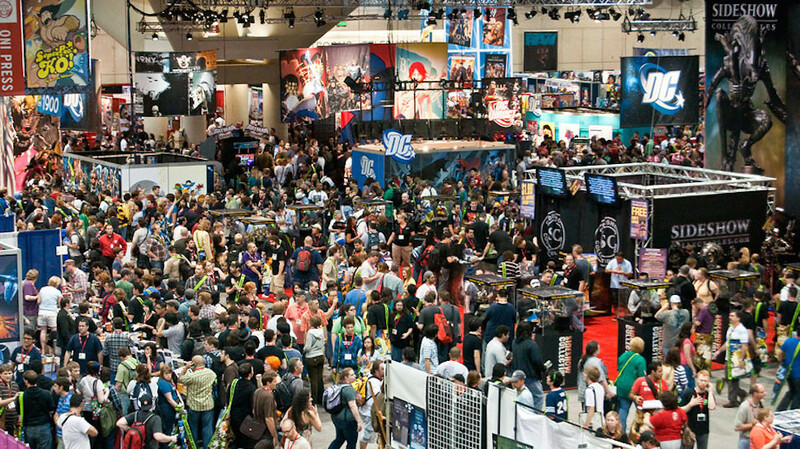 Doomsday BOUND will be available at the Mattel booth at SDCC 2014 and later on MattyCollector.com. 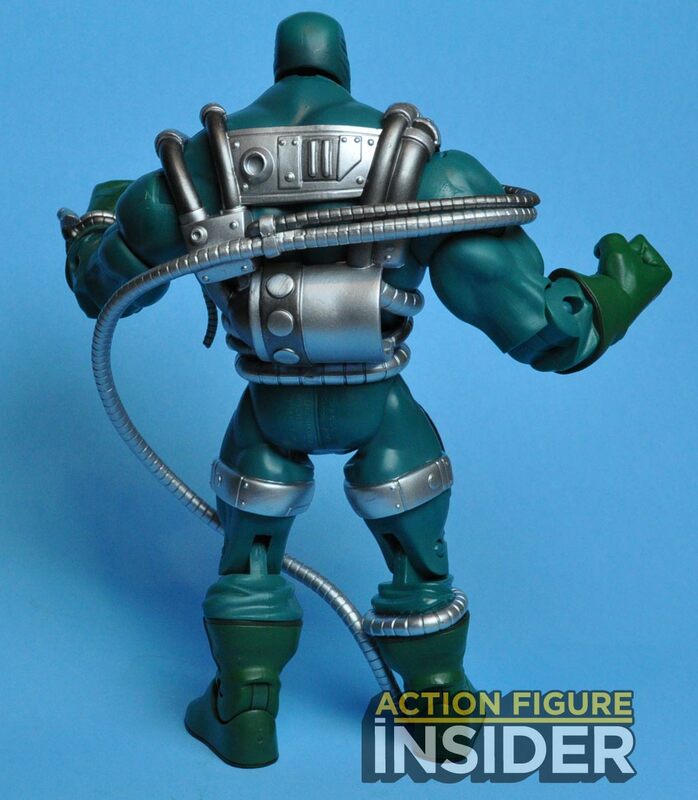 Thanks to Mattel for letting us give you an early look at the figure and the package. Sigh, I don’t think I will be getting this. All it will do is remind me of the awesome Doomsday we *didn’t* get. I really hope Mattel gets stuck with so many they can’t give them away. Wonder how much it’ll be. I might wait until Cyber Monday or something. IF I get him at all. I would rather have had the REAL version–the Unleashed version. Man, this figure sums up so much of how Mattel failed with this line. 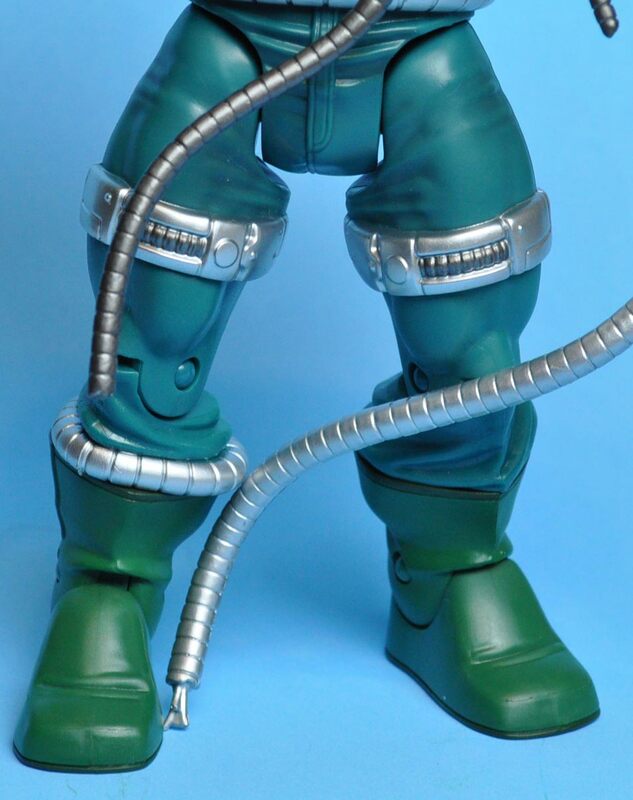 They had a perfect blueprint with Marvel Legends and just blew it. Shame. 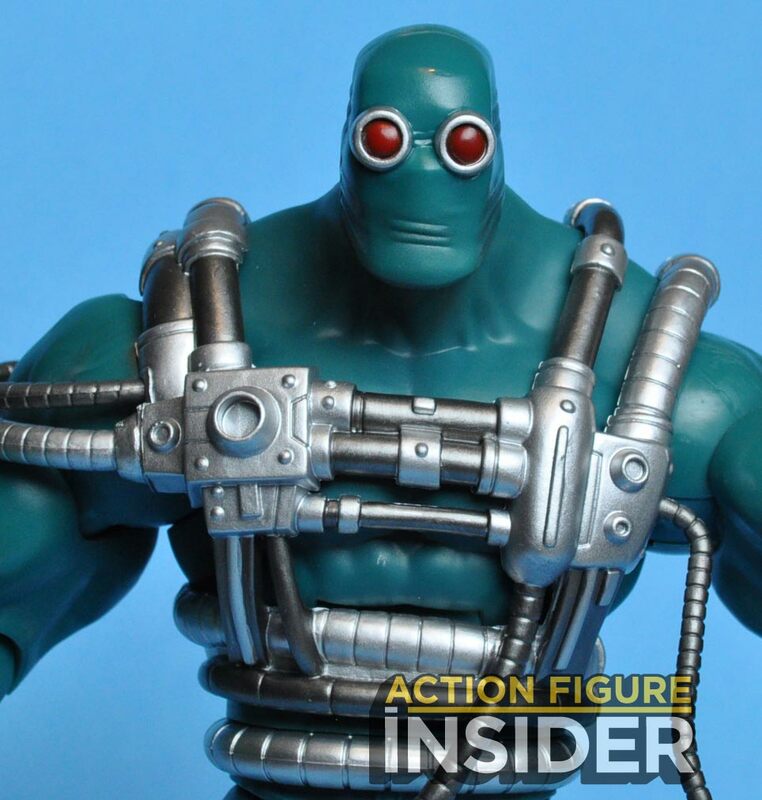 Well I for one think he looks awesome and I hope I can get this ‘never before seen in action figure form’ version of Doomsday. But it’s WRONG! He should have his right arm restrained! That was part of the “joke” if you will. He didn’t just defeat the Justice League he defeated the Justice League with one arm tied behind his back! If memory serves (and I won’t deny it’s kind of fuzzy) he never appeared fully suited with both arms free. They were freed when the League did the master blaster all energy zappy attack at which point his suit was shredded and the restraints were destroyed. Plus his left fist should have bone knuckles poking through! I know I’m being pedantic but dang it if they’re going to do this variant they should do it RIGHT!